Cheri will travel to your location to teach, or you can travel to Cheri's Studio in Greenville, Indiana for a private or group workshop. Please contact Cheri if you wish to inquire about scheduling a workshop at your location or at the Studio. Oil Painting Expressions Online E-Course. 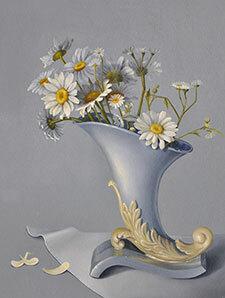 Along with 7 well known oil artists from around the globe, teaching diverse subjects blended with unique styles, Cheryle will be offering Pansies and Brass Bowl. Visit OilPaintingExpressions.com to find out all about this exciting course. For one fee you can learn from each of these artists. What a great opportunity! Take the course in the comfort of your own surroundings at your leisure. Class videos and tutorials are fully accessible to February 1, 2017. Location - Greenville, Indiana. 35 min. west of Louiseville, Ky airpot on I-64. Workshop fee includes -- class instruction, a continental breakfast and lunch. A minimal Lab Fee will be charged. There are many selections for very reasonable housing in the area. Please call or E-mail for a list.